What are the uni-beaver's demands? More logs to chew? Does he live in a shack or a dam? Tell me more . . . 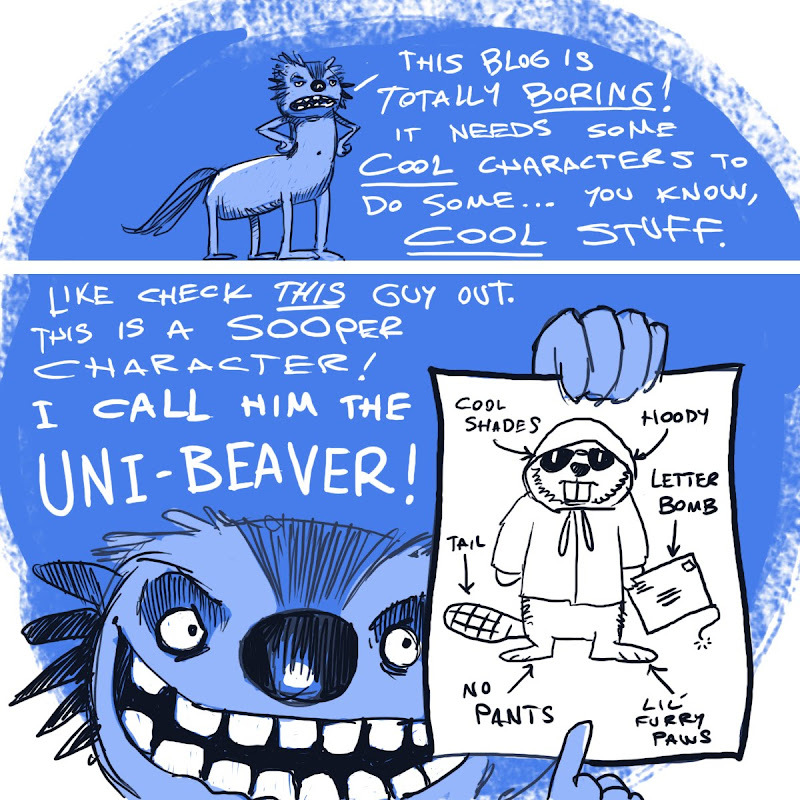 I love uni-beaver! He's too cute to be evil! The Uni-Beaver has no demands. He jus' wants to be awesome and cool. And blow stuff up with envelopes! This guy's so much cooler than Chucky Isopod it's not even funny. Yeah. I was so right. That NaNoWriMo thing is a total freak. All work and no play turns Nate into the Unibeaver? Mindy, he's home! You need a break. Should we send chocolate? I'm more worried about the centaur-thing. Centaur thing! Centaur THING? I'm not a Centaur THING! I'm a Cen-taur! I'm CHESTER, the MAGICAL Centaur! Full time NaNoWriMo Monster! Part-time mixed martial artist! Don't go calling me a THING! I apologize, but you're not a REAL centaur because as far as I can tell you're not remotely human. I'll call you the NaNoWriMo monster from now on, if you like.